An unexpected difficulty in producing models of very early railway vehicles was the extremely small size of their journals and axleboxes, to the extent that in some cases commercially available wheels and bearings which are perfectly satisfactory for more modern prototypes simply could not be fitted in. This factor more than any other led Parliamentary Trains to develop our own range of wheels for early carriages and wagons. Once we had done so it became evident that underframe designs could be simplified, as it is usually possible to spring the short-axle wheelsets into place into fully assembled underframes, which cannot be done with the long ended axles. A very large proportion of early vehicles ran on 3 foot diameter wheels of various designs, which were interchangeable as long as they had the same journal size. When we studied these wheels it was noticeable how slender the wheel rims and tyres were compared with later types, so we have taken this into account, as well as greatly reducing the outward projection of the axles and bearings. We took care to keep the distance between axleguard faces and the diameter of the bearings unchanged, so that as long as wheels and bearings are both replaced, our wheels can be directly substituted for other makes. One factor which changed with the years is that thicker tyres were fitted, increasing the diameter on the tread by an inch. Our wheels retain the original diameter. In the interests of appearance the wheels and axles have been chemically blackened. The various centre designs are laser cut from a rigid black engineered plastic, so in most cases no painting is necessary. All types are available to Fine Scale standards for Gauge 0. Five of the drawings below are taken from D K Clark’s Railway Machinery of 1855 and show 3ft diameter wheels. The one on the right is a 3ft 1in wheel as illustrated in Railway Mechanical Engineering, published in 1923, and has a noticeably heavier rim. Our version of this wheel has the same slender rim as the other types and so is just 3ft in diameter.. 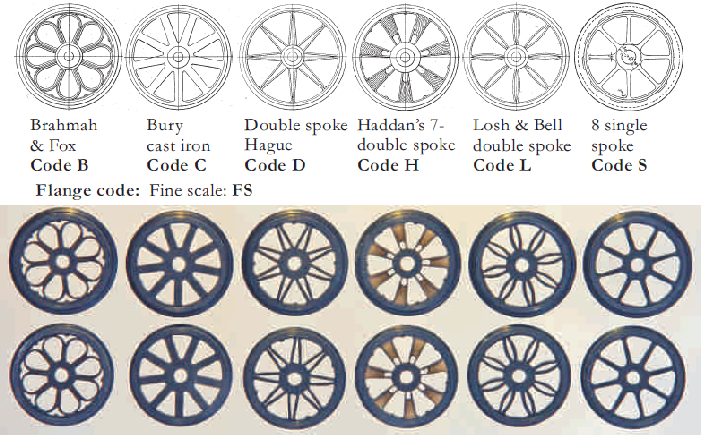 The double-spoke Hague wheel and the 8 single-spoke type became predominant, and were common for as long as traditional British goods wagons remained in service. The others were not in production so long, but all could commonly be found on mid-nineteenth century wagons and carriages. The least-known of them, the Haddan’s wheel, was surprisingly common among the coaches illustrated in the June 1845 Hansard report to Parliament reporting on how the various companies had implemented the Railway Regulation Act of 1844. Clark commented that the wood blocks between the spokes tended to shrink and fall out, so maybe the railways consigned them to their least important carriages! In addition we have produced a number of other types, including types suitable for Chaldrons as well as other early wheels.